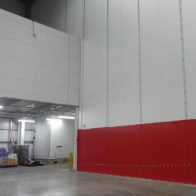 Westgate was called in by NFT Distribution to create a partition in a new build chilled warehouse at Tilbury Docks. This requirement had been driven by a new contract that required part of the existing warehouse to operate at a colder temperature. The temperature of the primary area of the warehouse was 2 degrees, they needed to create another area within the warehouse with a deep chill temperature of -2 degrees. The task in itself is something that Westgate are used to and have implemented many times in the past. The special requirement on this job was that NFT Distribution needed to have the partition in place within two weeks to meet production demands. 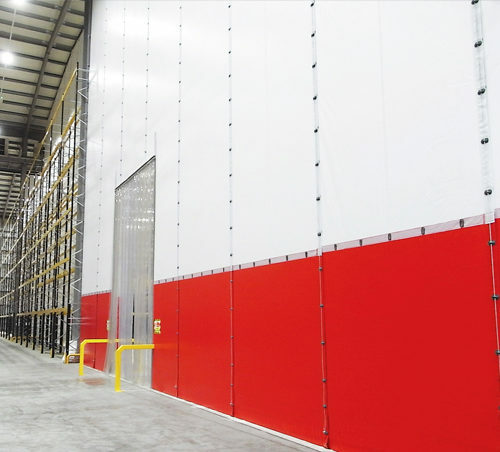 After a short spell of consultation and design, Westgate immediately began the task of installing a Flexiwall® partition that was 21 metres high and 90 metres wide. 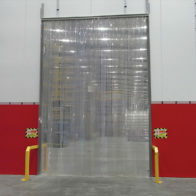 The Flexiwall was designed in such a manner that it can be extended and added to at a later point in time if the company’s needs change. The partitions lower section was created with the intention of giving a corporate look, similar to the corporate colours of NFT Distribution with the use of red fabric. Also installed was a Flexistrip® PVC strip door, which provides easy and hassle free access for forklifts. The primary benefit to the client since the new partition was installed has been the ability to control the temperature as requested and fulfil the requirements of the new contract. Although the products flexibility, quick non-disruptive installation and cost effectiveness were highly advantageous, the speed at which Westgate were able to turn this project around was a key factor in NFT working with Westgate.